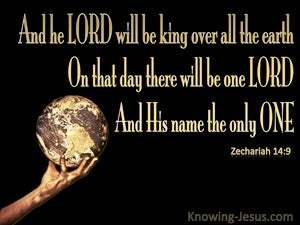 ﻿ Zechariah 14:9 And the LORD will be king over all the earth; in that day the LORD will be the only one, and His name the only one. On that day Yahweh will become king over all the earth-Yahweh alone, and His name alone. The LORD will be king over all the earth at that time. There will be one LORD, and his name the only one. And LORD shall be King over all the earth. In that day LORD shall be one, and his name one. And Jehovah shall be King over all the earth: in that day shall Jehovah be one, and his name one. And the Lord shall be King over all the earth; in that day the Lord shall be one [in the recognition and worship of men] and His name one. 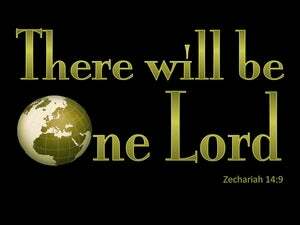 And the Lord will be King over all the earth: in that day there will be one Lord and his name one. And the LORD shall be king over all the earth; in that day the LORD shall be one, and his name one. And Jehovah was for king over all the earth: in that day Jehovah shall be one, and his name one. And Yahweh will be king over all the earth; on that day Yahweh will be one and his name one. And Jehovah shall be King over all the earth; in that day there shall be one Jehovah, and His name shall be one. And the LORD himself shall be king over all the earth. At that time shall there be one LORD only, and his name shall be but one. The Lord will then be king over all the earth. In that day the Lord will be seen as one with a single name. The LORD will be King over all the earth. In that day the LORD will be one, and his name one. So will Yahweh become king over all the earth, - In that day, shall there be one Yahweh, and, his Name, be one. And the LORD will be king over all the earth: in that day will there be one LORD, and his name one. Yahweh will be King over all the earth. In that day Yahweh will be one, and his name one. And Jehovah hath become king over all the land, In that day there is one Jehovah, and His name one. 8 And in that day living waters will flow out of Jerusalem, half of them toward the eastern sea and the other half toward the western sea; it will be in summer as well as in winter. 9 And the LORD will be king over all the earth; in that day the LORD will be the only one, and His name the only one. 10 All the land will be changed into a plain from Geba to Rimmon south of Jerusalem; but Jerusalem will rise and remain on its site from Benjamin's Gate as far as the place of the First Gate to the Corner Gate, and from the Tower of Hananel to the king's wine presses.